I got up early and the promise of sunny weather from yesterday is gone. It has clouded over again. The road to the borden passses through boggy barrens. The border itself was a bit of a surprise. It is invisible. The only clue that it is a different country is that the highway signs are a different colour. It's downhill through more uninhabited land to Lutnes on the Trysil or Klara River. I cooked breakfast in a little park by a power dam. My lack of Norwegian money was no problem since there weren't any stores here anyway! The road then climbs a major ridge in long switchbacks. Coming down the other side there are few small farms and clues that farm animal have been on the road. Route 25 has more traffic than most of the roads I had been on for the last few days but traffic was still very friendly. Still, I prefer the more intimate back roads, they are not as many here as in southern Sweden. Distance 125 km Climb 1000 m ?? The morning started out sunny and the temperature was rising quickly. Maybe summer is finally here? It is supposed to be only 60 km to Lillehammer through farmlands along the lake so I expected an easy morning ride. I started out on a nice street along the lake. From the map it wasn't clear if it continued but it looked nice. It got narrower and narrower and finally ended at the base of cliffs. There was only room along the lake shore for the railroad tracks. So I went back and then up the hill on the edge of town, then on to some roads heading towards Brumunddal. These Norwegian farms seem to defy gravity. There were big dairy farms perched on incredibly steep hills. A topo map would have been helpful here. Also my road map (300000 scale) had the main E6 highway as a wide line which "hides" some of the smaller roads near it. Past Blumundal I got on a dirt road with some steep switchbacks. I wasn't complaining since it was good condition (coming down it might have been tricky) and the scenery was lovely. Back down to lake level at Moelv and then there is a bike path out of town, then it's relatively flat to Lillehammer. I got to Lillehammer in mid-afternoon too early to stop but too late to continue so I decided to explore the area and stay overnight. The weather was looking threatening. I rode up to the main Håkan Hall, the main Olympic arena and had lunch in the cafeteria to escape a few showers. Then I decided to continue up to the Birkebeiner Ski Stadium. That was about a 400 m climb! The stadium area was deserted! Over 1000000 people had trekked up here during the Olympics. There was a nice view of the town and the lake below so it wasn't a total waste. Too bad it was raining. Then I went back to Håkan Hall and picked up some info on trails for possible future ski trips. Besides the Olympic trails there is the famous Birkebeiner Trail which goes to Sjusjoen, then to Rena ( 55 km). That's just a small sample of the thousands of Kms of trails in the area. The Birkebeiner race is in Mid- March and usually has fewer participants than Vasaloppet (only 9000 this year). So back to town and to the hostel which is in the railway station building. There were quite a few tourists in Torget (market square) even though all the stores were closed. I had a hard time finding a convenience store with bread. I also made a quick trip to see the SWIX factory. Today it stayed sunny most of the day, although it didn't get very warm. This was to be a WOW day. I did a quick shopping trip downtown and it was after 1000 before I left. There is a nice bakery on the other side of the lake where I bought some "Energi" bread. The plateau at the top had a barren area. On both sides of the road I saw trail map signs with the numerous ski trails connecting all the villages, farms and huts in the area. This looks an interesting place for a ski trip! I noticed a few cattle guards across the road and rode across them cautiously. Then there was a dip in the road and I was zooming down around a corner when I found out who has the right of way on these roads! There was a group of sheep standing in the middle of this narrow road. I braked, rang my bell but they didn't move. I cautiously manouvered around them and they started following me as I started climbing again. They gave up interest and stopped, still in the middle of road. Behind me, I saw a car coming. It had to stop, blow its horn but the sheep weren't moving until they felt like it. I thought that these were just a few sheep that had escaped pasture but it became a common sight for the next few days. I stopped for a caffein boost at a cafe at Storlon Dam. The owner said they had lots of snow this winter. Looks like a good destination for a future ski tour. Then I sat out by the dam, eating my "Energi Bröd". More sheep provided entertainment. The ewes would sit down on the road, while the lambs took milk. Fortunately, traffic was light. I never saw any road- kill sheep. Then it was a nice downhill to Dokka where I stopped at a grocery store. There is a cycle path west from town along Rt 33 for a few K's. I stopped for a second lunch by a waterfalls. I thought I might follow a valley all the way to Aurdal but this valley ends and then there was a 600 m climb over a pass to the next valley. Then it is a nice long downhill to the junction of E16, which had very light traffic for an E road. The road continues downhill to Leira. The wind had dropped off so I had the strange experience of no headwind! I arrived in Leira about 2030 and found the VH (hostel). The VH in Leira is in part of a Folk High School. Visible and audible through the woods behind the school grounds was a nice waterfall. I started walking towards it but then I found that it was a lot further away, and bigger, than I thought. A group of musicians (string quartets, I think) was also staying here. I was hoping to hear a little Grieg with the sound of the falls in the background. No luck, but I could hear some cellos practicing. There was an American family here, visiting with Norwegian cousins. I also saw a Norwegian with a Canadian flag. He had relatives in Alberta. Another WOW day. It was partly cloudy with light winds but still not real summer. I had a snack and coffee at a cafe near Solseter, where there were pictures and awards of the local ski team. The main road descends about 400 m in 5 km by several switchbacks to Gol but I turned right on a side road which stayed on top of a ridge. There is a great view looking down into Hemsedal and the ribbon falls of Hydnefoss, which I will see for the next hour. At Robbru I join Rt 52 which had to climb back up from Gol. About 5 km before Hemsedal town I turn off on a nice back road to Torset. It goes by some quaint little farms. I have a second lunch on a rock on the river bank just before entering the town. This is a more touristy resort. It is late afternoon but too early to stop yet. I study the topo maps in the tourist bureau for the trip over the pass. Traffic is very light as I head up the valley but I have to pause to let cows pass on their way back to pasture from milking . I take a short hike to another falls, in the next few days I will never be out of sight of a waterfalls! The road goes through a narrow canyon into the valley called Mörkedalen (sounds like a dark Tolkeinesque place). However it opens to a very broad valley, mostly above the tree line. There are still small cultivated fields up here but later it is more like tundra with seters (shepherds huts) scattered around. The climb is very gradual, at about 1000 m there were quite a few snow patches. In this open expanse I can see forward and back on the highway for about 10 km and not see much traffic. This would be a horrible place on a windy day but there is now no wind. The most predominant sound is water: the drip-drip of melting snow, the babbling of brooks, the roar of distant falls. Of course there is also the baahing of sheep. I was a little disappointed not to see any reindeer ( called caribou in Canada). The summit is at 1100 m , the lake here still has a few bits of ice floating in it. Then I start out down the other side which is a gentle slope at first. It is rather disorienting to be riding at this latitude on a June evening. I have lost track of time- it is after 2100 and the sun will not set for another 2 hours! Then there are some switchbacks. At the first corner I find a track leading down towards the river and decide to camp here. The altitude is 900 m and it is just at the tree line. This "Babbling brook" is really a roaring river but it soothes me to sleep although it does seem strange to be going to bed when it is not dark. A little rain fell during the "night"
In the "morning" there were some big blue patches in the sky as I looked out of my tent. Also a small herd of curious sheep. I had a quick snack, packed up and headed down the hill with several switchbacks past many waterfalls to the junction of E16 at Borlaug, dropping about 400m in 5 km. Then it is a more gentle descent in the valley to Borgund. I took a quick walk up part of Vindhell Vegen which is a section of the original road. 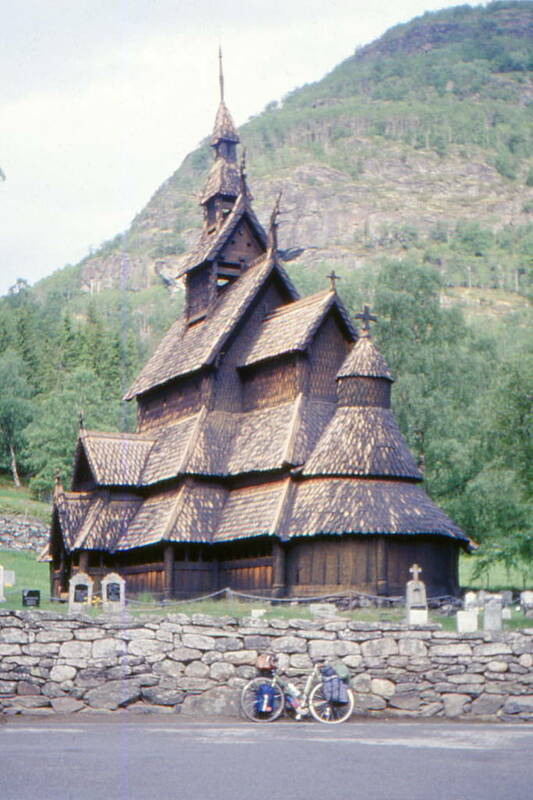 Then I stop to take the obligatory picture of the Borgund Stav church. The place is still empty at this early hour. I cook breakfast in a picnic area just across the road. Before I leave, several tour buses arrive. This is one of the most photographed sites in Norway. Then it's a stupendous downhill along the the Laerdal River. This is whitewater cycling at its best! All I can hear is roaring water. For much of the time feel like I am in the river, bouncing over the big waves. There are waterfalls coming down the cliffs everywhere. There are a few narrow canyons and a few short tunnels. I'm down to my last few pictures in my last roll of film so I had to limit my picture taking. After almost 50 km of downhill I'm at Laerdal town, at sea level. This is part of the Sogne Fjord, the longest in the world. I buy some film, groceries, have a snack and talk to a German cyclist. It's a flat ride along the fjord , with a few short tunnels to the ferry at Revsnes. Unfortunately, now that I have a new roll of film, I can't use it. Clouds have moved in, blocking most of the views of the fjord. After crossing the ferry about 1300, the rain starts. After going downhill all morning the climb up from the ferry seems hard. I stop at a gas station/restaurant for some coffee. I'm very reluctant to go out again. I arrived in Sogndal wet and cold so I decided to abandon plans to my original destination of Skjolden. I checked into the hostel and then did laundry. I had noticed a sign for the local radio station- "Radio Gravenstein". I asked the girl in the office and she said it was named after the famous NORWEGIAN apple. I had always thought that the Gravenstein was developed in Nova Scotia. Norway seems to be the only other place that grows Gravensteins. It seemed stange to see the familiar apple orchards, the blossoms just past a few weeks ago, and look up and see snow a little ways up the hills. Why, after such a short day, mostly downhill, did I feel so tired? This was to be a slow day. It started off cool, with showers. Western Norway is the the wettest part of the country and this had been the wettest June this century. At the mouth of the fjord it is even wetter. The showers paused as I headed up at a steep hill out of town. There was a short tunnel and I saw the old road around it. There was a No-exit sign but it looked too interesting to pass. It was a nice narrow road through trees with the old stone wall along the edge. There were a few places I had to squeeze by some stacks of logs. Then I got almost back to the main road but there was a high guard rail along it with no break in sight. This is one time I wish I was travelling more lightly. However it only took a minute to detach some weight and lift the bike across. Then it was a fast downhill to the Solvern ferry dock where I had to wait for about 30 minutes. The overcast skies had broken up a bit so I did get some better views of the fjord. In places the walls of the fjord are over 1000 m high. There was only one car on the ferry with me as I crossed to Urnes so I didn't expect much traffic on the other side. 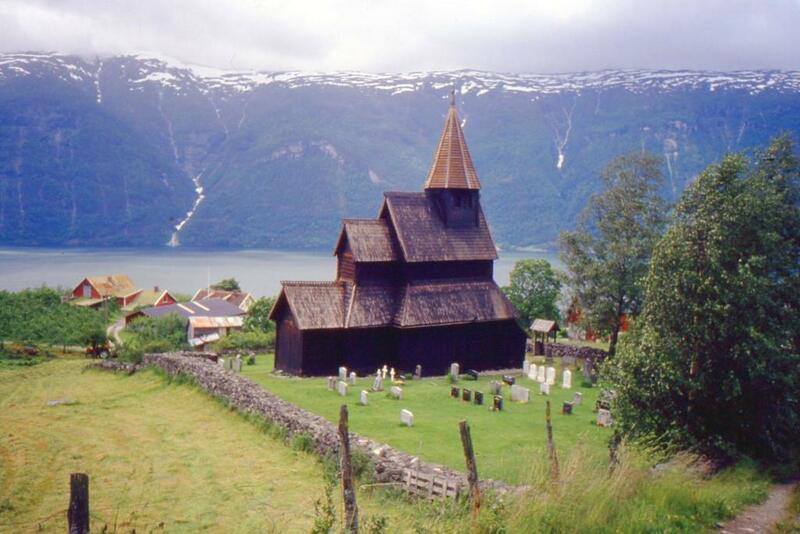 On the other side is another famous Stav Church. The road up to it is very steep so I left my bike in the picnic area and walked up to it , past some apple orchards and the interesting hay drying fences (hesje). 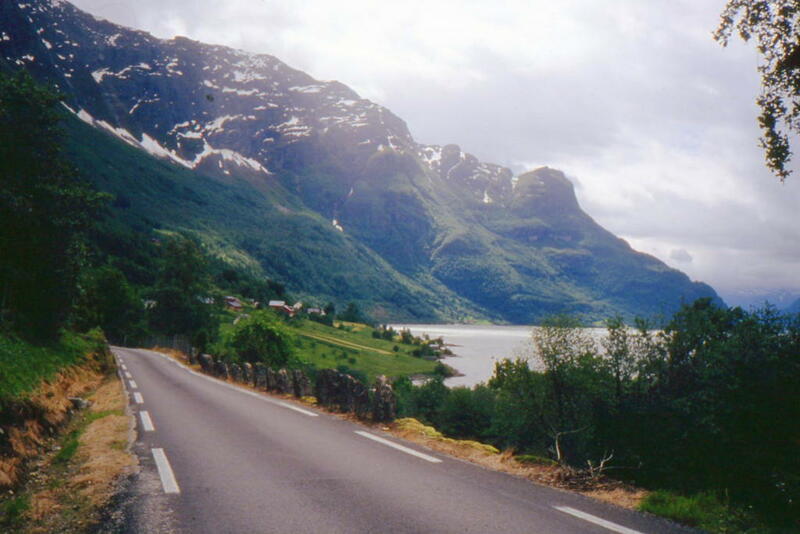 The road along this side of the fjord is beautiful , one lane with very little traffic. When I passed streams coming down from the mountains the temperature dropped about 10 degrees. Then there were the tunnels. The first sign said 400 m. No problem. HEY, it's DARK in here! Where's my light? Turn around and go back out. I strapped my Micro-Zoom on to my helmet and turned on my rear Vistalight. I went through with no problems. The next tunnel was nearly 1 km long with a curve so it got very dark. In the movies (Indiana Jones etc) the cave explorers just light a candle and the whole cave lights up. Well, that doesn't happen in real life. All I saw was a tiny cone of light. I got off my bike and walked, looking for the next white stripe on the road. A few cars passed me in both direction but there was enough room to get out of the way. I had my Vista light flashing and was wearing a reflective vest. I was probably only in the dark for 5 minutes. The next tunnel was straight so I could see light straight through. I got to Skjolden at 1500 as it was starting to rain again. I ducked into a bus stop shelter and had a chat with a German couple who had come down the mountain. I ate some more lunch. I didn't want to go over the mountain in the clouds since this was supposed to be the climax of my whole trip. So I checked into the hostel, which was in a nice location beside the river. The rain had let up a bit and I was bored after only riding 48 km today so I took a little trip up the Mörkri valley along an overflowing river. The road got narrower and narrower and passed through some pastures. There was a trail to a big falls but it looked like it was flooded. There were lots of smaller falls . From the map I saw that the road became a trail which climbed all the way to a branch of Jostedalsbreen, the largest glacier in Europe. Back in town I went for a short swim in the indoor pool and used the sauna. When I got back to the hostel there were 2 Norwegian cyclists having supper in the restaurant. They wanted to continue up to Turtagro (900m) and I couldn't convince them to wait until the morning. It would have been nice to ride with Norwegian cyclists. There were 3 other cyclists (German) at the hostel who were also heading my way. Unfortunately I have a problem. For the first time in many days I took a serious look at the calendar and realized that I had only 7 days to get back to Copenhagen. 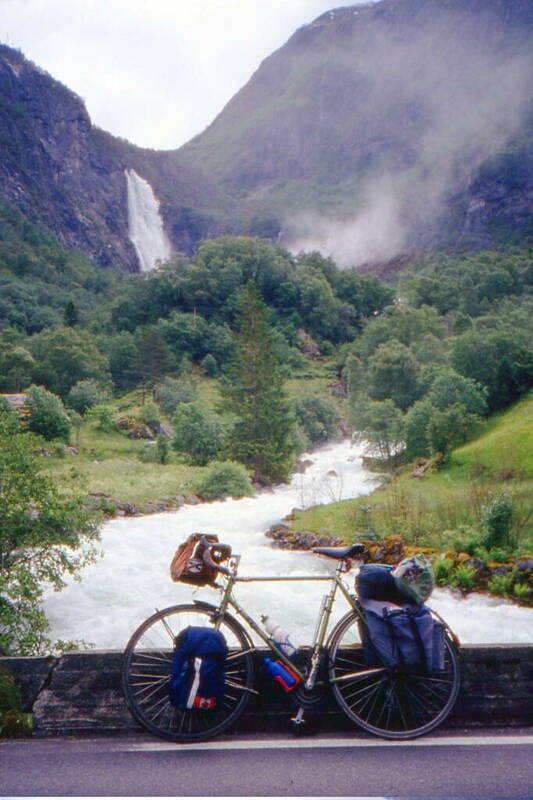 I was going to have to abandon plans of riding Trollstig Veien north to Åndalsnes. 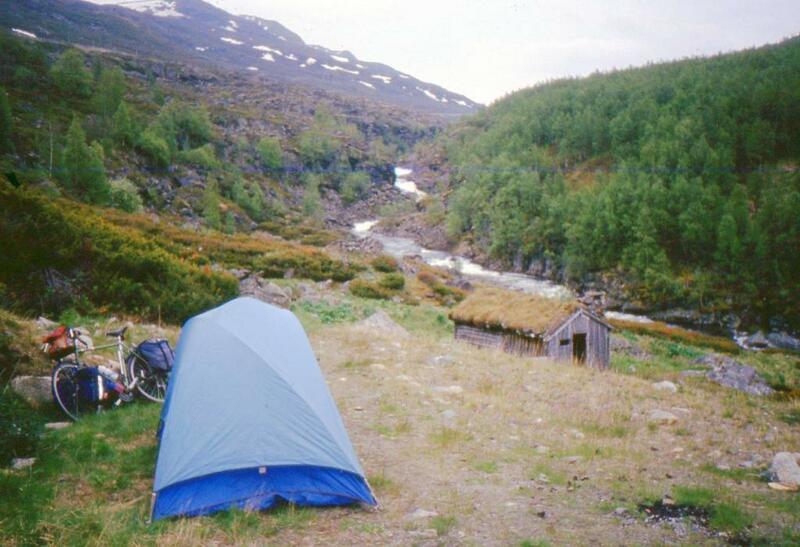 However the Sognefjell on Jotunheimen was a "must do". I'll ride to Otta and then see what happens. I expected this day to be the high point, in many ways, of my trip. The pass at Sognefjell is the highest (1432 m) in Norway. 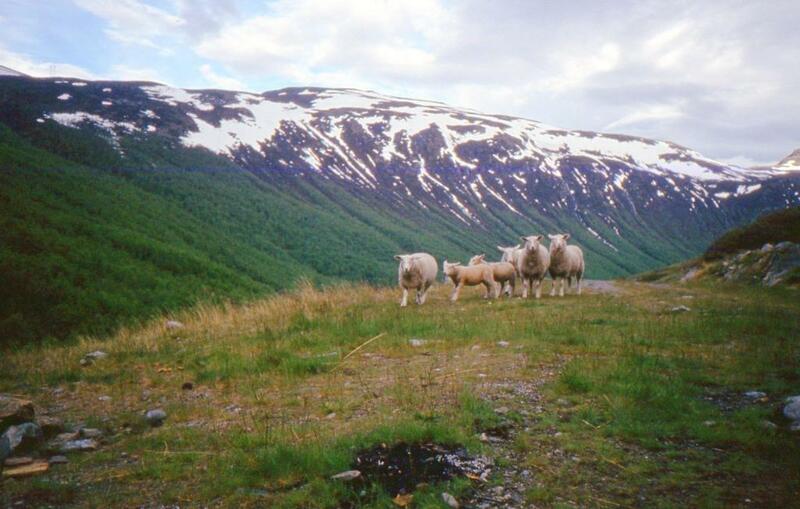 The mountain range, Jotunheimen , has the highest peaks (2400 m) north of the Alps. "Climb ever mountain, ford every stream..."
Again the main sound is the rushing of water, there are waterfalls everywhere. Now I am whitewater cycling upstream . It is still quite cool but I stripped down to shorts and T shirt. At about 900 m I reach the treeline near the Turtagro Hotel. THere were groups of hikers preparing for a trek, wearing winter clothes but no sign of the 2 cyclists I had seen yesterday. When I stop I get chilled quickly, so I press on up some more switchbacks. There are signs at 1000,1100,1200,1300 m and they agree quite well with my altimeter. "... follow every rainbow, till you find your dream"
At around 1400 m the road flattens out but then there are some big dips and rises on the plateau. The patches of snow have given way to total snow coverage, at many places I can not see over the snow banks. 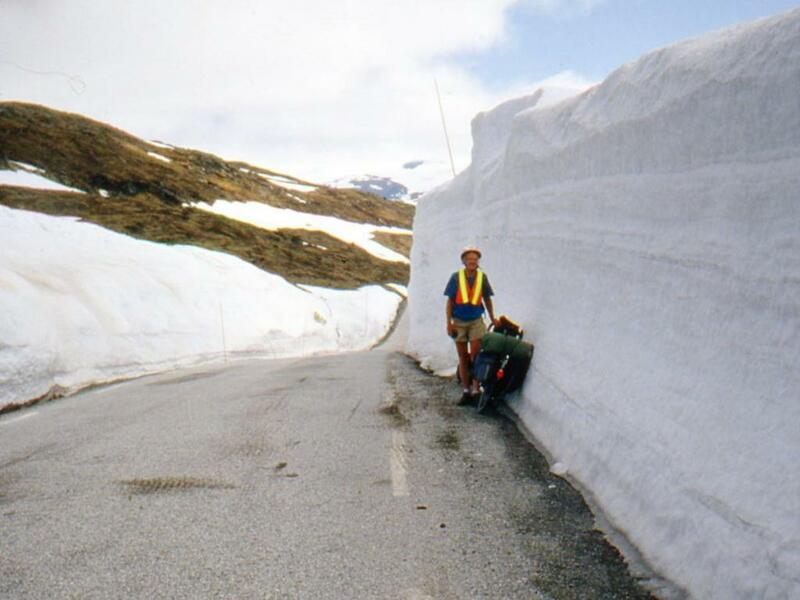 I meet a Swiss couple on a tandem who say that this is the highest snow bank. I suggest that 1400 m must just be a small hill to the Swiss but they were impressed by it. They take a picture of me, dwarfed by the 4 m snow bank. At about 1230 I reach the Sognefjell hotel and restaurant. The ski rental place was closed until 1400. I was very tempted to wait but I had many miles (nordic mile or "mil" = 10 km !) to go before I sleep. Ski conditions were excellent- it was a red klister day but most of the rental skis were waxless. From the names on some of the buses, it appeared that some top ranked ski teams were here. The clouds had completely broke up, revealing the Jotunheim in all its beauty. 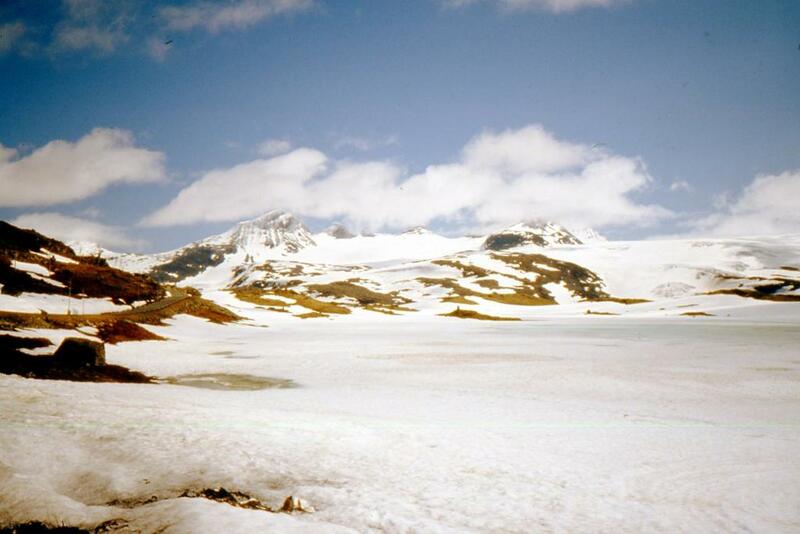 There are several peaks rising about 1000 m above the plateau with many glaciers. Lakes are completely frozen. This is truly Jotunheimen, the Home of Giants! The road continues along the plateau and there is a sign at the highest point at 1434 m. At this point I have climbed 1600 m , from sea level. Then I put on some more clothes for the descent. There are few switchbacks but mostly it is long straight runs. Most of the time I'm riding along a raging river. More white water cycling ! The first trees are small birches , the buds are just beginning to open. Lower down in the Bo"verdal it gets warmer. The climate looks much drier, much like the Okanagan in central B.C. Lower down I see irrigation sprayers, strange since the low lying fiels are now flooded by swollen rivers. In Lom I buy some more film and some groceries. Then I cross to the north side of the chain of lakes on the Otta River. For a while the road is unpaved but it is nice. There are a few hills and they pushed my daily climb over 2000 m for a new personal record. I can see a long tunnel on the other side that I'm glad I missed since there was considerable traffic. I stopped for a few minutes to watch a hang glider that looked like it would land in the lake. It made it to a field on the other side. Today I feel as if I have been hang gliding and white water rafting for free! I had supper in a picnic area in Vågåmo. It got quiet cool as the sun went behind the hills, I guess there's lots of cold air coming down from the snow fields. The main road, Rt 15 then took the north side of the river and I went on the south side to Lalm. Again it was hard to judge that it was late evening without looking at my watch. This was my most northerly point about 62 N. Lat. I go up a rather steep dirt road and find a place to camp in the woods, beside a babbling brook. Tommorow it should only be an hour ride to Otta where I'll take a train to Oslo.